Series mobile apps games scan "Innovator". Startup "ALKOScan". Another ideological creation of the author of innovative startups from the mobile applications games scan "Innovator". In this presentation we will presents game scan quite a pleasant pastime of its users, namely the alcoholic subjects that are popular nowadays. Startup "ALKOScan" from the mobile applications games scan "Innovator" in your main area will show the selected user focused information in the process of passing the leisure activities and places, participants in these activities who are already in a state of alcoholic intoxication, photo and video fixing of alcohol and alcoholic beverages these participants, and of the results after the process such a pleasure alcoholic events. We can say that there is nothing new, yet this startup is not offered. Most user do, when you do a photo report such events. But the basic functionality will be slightly lower, especially because this app game scan! So, when the user of this innovative startup begins to photo and video fixation process events, then the startup starts to back up photos and videos in its memory. That is, given that the user will be in the same condition as his company, all the survey materials from will be displayed. They will be archived, as mentioned previously, and available to his display and playback only via the established beforehand in the settings of this application, the term. For example, in 5-6 hours. During this time, the startup "ALKOScan" will form into groups the materials in appearance, the faces of the participants before and after the event, the results of following and completing this event. How this will happen in a General example - a user in the course of the event is photo and video shooting from the beginning to the end of her passage. He does not see that he was removed as the program's archives for internal processing or if just to say, for internal scanning. In the morning the user will have access to all these photos and videos that have already been scanned and sorted into groups by appearance and faces. If enabled, the public view then it will be possible to come to any user who has participated in this entertaining event, and see the now sober view of yourself and your company, only a pre as a leading entertainment and alcoholic state. The best materials on this subject, because this is a game scan, it will be possible to present in a public rating. That is, we have an app that first hide and then show us scanned in a time when we didn't really accurately assess their actions, and it is in a state of alcoholic intoxication. This is the main gaming and entertainment functionality startup "ALKOScan". Many smartphone manufacturers strive to surprise and amaze their users by all means - however, the main problem is that as they experiment with the form and technological features of devices, the reality of their realization melts. However, Samsung has its own vision of how to effectively combine reality with fiction - today, employees of the company presented to the public several concept art of the new Samsung patent, demonstrating a very surprising and original in design mobile device. It is quite possible that the company will move further in this direction. Concept art showed a smartphone, absolutely all parts of which are covered with a display - in the manner that we could see while introducing a new Infinity Flex Display folding display technology. However, the current patent clearly traces the tendency and the desire of the South Korean manufacturer to cover the active part of the display with absolutely every facet of the intended device. Thus, the patent illustrates the model, in which the lower, upper and side parts are a continuous active display - although the back, apparently, is standard. It is difficult to say how this patent corresponds to an objective technical reality in its implementation, however, there are patents to demonstrate to the world their wide-ranging dreams - however, Samsung has very good chances that at a certain point in time to actually implement such a reality device. 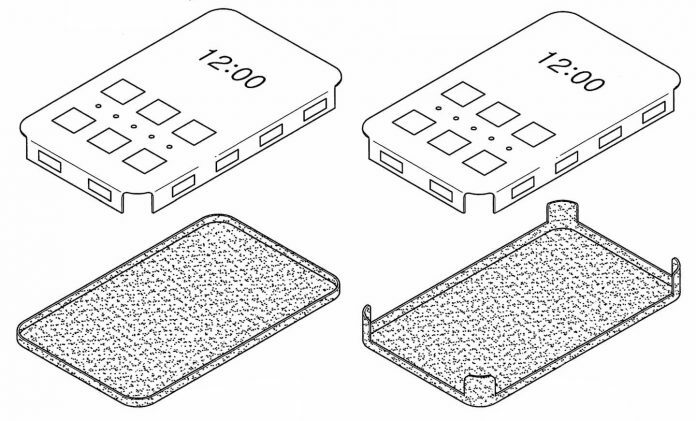 In addition, the second part of the patent and concept art also demonstrated the presence of an octagonal prototype of a Samsung smartphone, which is also covered with an active display from all sides. It is worth noting that the submitted patent is only part of Samsung’s technical and creative vision regarding the development of its new Infinity Flex Display line, but we can expect very unusual turns in terms of further development.